Stocked with your favorite salads, sandwiches, fresh fruit, snacks beverages and more. 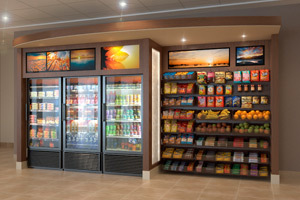 Introducing your office convenience store. Our Micro-Markets are fully customizable, self-operating, on location shoppes offering food, beverages, and non-food items. Micro-markets are ideal for offices, apartment buildings, hospitals, gyms, and many other locations. We are proud to provide our on-location Micro-Markets, offering you and your employees the highest quality, tastiest, and healthiest snacks, meals, and drinks available. We can tailor a program just for you. Use your cell phone or our kiosks to make purchases effortlessly. Contact us or call today to see how we can tailor a program just for you!